The frenzy of interest in batteries for home solar energy systems continues. Amid constant news about large-scale utility battery projects and small-scale home battery innovation, everyone seems to want battery backup. It doesn’t hurt that we just had a hurricane barrel up the Florida peninsula. There are just a few problems. Consumers are woefully misinformed about what batteries do. They are unrealistic about what they cost. And they don’t realize that you need a whole lot more than just batteries themselves to make them useful. People are emotionally invested in battery technology. They love Tesla (and there is a lot to love). Some people are not going to like what I have to say below. Batteries sell solar and vice-versa. What I have to say below is definitely not self-serving – just a practical look at where we are with battery technology and how it fits into the world of home electricity backup solutions. Most consumers think of batteries for household energy use as an alternative to fuel. However, batteries are not analogous to fuel but are more closely equated to a fuel tank. Batteries simply store energy. Once depleted, they need to be refilled. Their fuel can come from a variety of sources. Utility power, solar energy, and generator output are examples. Batteries don’t make fuel. They just store it. And the fuel tank level needs to constantly be maintained. Imagine if your car’s fuel tank evaporated when not in use. Rechargeable batteries self-discharge, meaning they require power input even when not being actively used. The bottom line is that batteries are just a storage vessel. Tesla touts its Powerwall battery as “100% Self-Powered.” That assertion is laughable. If you dig into the “learn more” section, they are saying that by combining solar power with the battery, you can effectively go without using utility power. The battery is not “Self-Powered” at all. It’s powered by an outside source. Have you ever purchased a small electronic device like a flashlight, only to find out that the replacement batteries cost almost as much as the device? Frustrating, right? Imagine that on a household scale. Let’s pick on Tesla again. They have really good marketing. Too good. People come to us with this $5,500 figure in their head after seeing it on a website or hearing it in the news. They think that’s what it will cost to install battery backup for their home. Unfortunately, what most people don’t realize is that you need several batteries to provide a reasonable amount of power for a useful amount of time. If you want to store enough energy for an average home for a 7-day power outage (like many people experienced after Hurricane Irma), you would need to install 21 Tesla Powerwall batteries! Note: calculation based on 40kWh per day for 7 days, or 280kWH, which is how much energy 21 batteries store at their rated 13.5kWh each. From https://www.tesla.com/powerwall, 2/4/18 8:30am. The promise of 100% self-powered is based on having enough solar power installed, and 7 days of power is extremely misleading since you would really need several batteries to provide enough storage for practical use in a whole-home backup situation. And batteries don’t last forever. Lithium ion batteries typically come with a 10 year warranty. You will need to replace them at some point, creating a big expense in the future. A great example is The Quarry in Naples where many homeowners had small battery backup systems installed by the builder in about 2010. Now all of this old lead-acid batteries are dying and I’m often removing them rather than replacing them. The owners, often not original owners, simply don’t see the value and don’t want the expense. The fuel tank in your car and the fuel it stores are pretty useless without a whole lot of other stuff. There are fuel lines, pumps, and injectors to get fuel where it needs to go. Oh, and there that little thing called the engine that’s needed to make the car fulfill its basic purpose. Batteries are no different. They need wires and distribution equipment to get power where it needs to go, when it needs to go there. And the engine is an inverter that converts DC power to AC power that we all use in our homes. Once again, we will pick on Tesla. Their Powerwall actually integrates the inverter in the battery. What they are actually selling is a battery/inverter/charger/battery management system all in one elegant and simple cabinet. This has been done before with different battery technology in a much less elegant way, but the concept is nothing new. But the costs and complexity don’t end there. 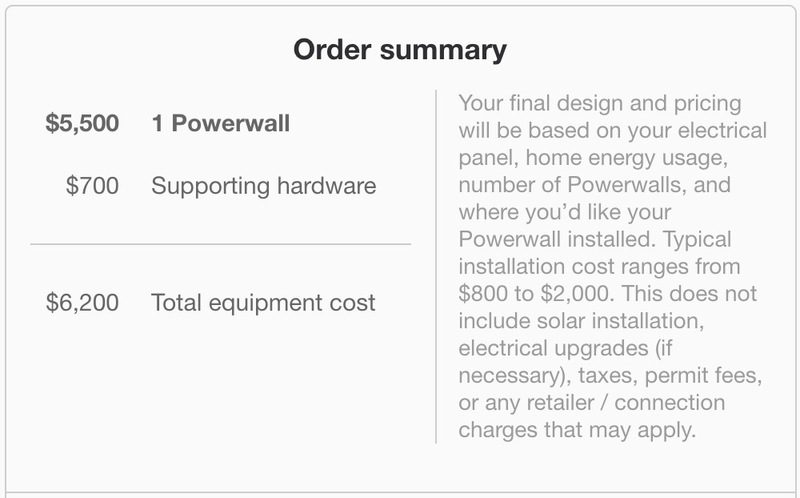 Tesla’s website says that it’s $5,500 battery requires $700 of “Supporting Hardware” and typically costs $800 to $2,000 for installation. Setting aside the not-included solar panels for a moment, they also gloss over the “electrical upgrades” requirement. In almost every case you will need to carve out the circuits you want to back up into a separate electrical distribution enclosure. In other words, you will need a separate circuit breaker enclosure to house the circuits and appliances that are capable of being backed up. This a hidden, not-so-inexpensive cost. The promise of batteries is not so much about backup, but stabilization of the larger utility grid. Shifting household power needs from centralized power plants to distributed energy storage devices makes a lot of sense. When centralized power plants need to provide peak energy, it costs a whole lot more to generate and distribute than what their baseline power production costs. Some states and utilities charge consumers based on time of use (TOU). Energy costs more to purchase at certain times of the day. Batteries hold the promise of shaving off this peak load, evening out the baseline and resulting in a lower blended cost for energy. Note that this has little to do with solar power directly. It’s simply about storing energy when it’s cheap and discharging it when it’s expensive. Consumers generally don’t understand this complicated concept. It’s much easier to market a product that fulfills a relatable consumer need. That need is to have stable, reliable, uninterrupted power in a convenient seamless package. In comes the use-case for battery backup. But as mentioned above, using batteries purely as a backup system is very expensive and not as easy as it sounds. Look at what Tesla is doing on a larger scale. They just announced a huge project in the South of Australia aimed at stabilizing the utility grid. They are providing energy storage for discharge during peak consumer demand. That’s not backup power. But it is a great idea, and it works. However, this system would not work as a 100% backup to all of the area’s demand. It’s not “100% Self-Powered.” We’re not there yet with battery technology. Batteries and solar panels conflate two needs – the need for energy storage and the need for power generation. I encourage people to think of these subjects separately. When you combine the two, you confuse the two. We often steer people into household generators rather than batteries for home backup. For a traditional generator, the battery is the fuel tank and the gas is the solar power. The inverter is the engine. You are limited in your backup capacity by how much fuel you can store in the tank and how much more fuel you can get delivered. The size of the engine dictates how many appliances you can run at once. What happens if it is cloudy for a couple of days? Solar power is unreliable. You need to have enough battery capacity to get you through the times when you can’t get fuel (solar power) delivered. You need a really big battery! It’s important to separate energy storage (the size of your tank) from power generation (the reliability of fuel supply) when thinking of any backup solution. Your largest instantaneous power needs (engine size/inverter rating) is a pretty simple calculation and easily controllable. But storage and generation needs are much more difficult to predict are require much more forethought. We see this with off-grid solar energy systems. Can you go off-grid completely? Of course you can! With enough money and dynamite, you can do just about anything. But seriously, going off-grid is expensive. It’s not so much that the equipment is wildly expensive. It’s that you have to plan for every eventuality. You have to oversize everything to provide the experience you need and the convenience you expect. And you have to maintain the system and replace it at some point. Considering batteries to backup your home comes with the same dilemmas. Is it really worth it? Is there an alternative that is less expensive, more reliable, has less maintenance, brings less risk, etc. A common request is to have a remote barn or garage solar powered. We can do it. But it’s expensive, no doubt. Let’s say you want to power your remote garage 4 hours each weekend when you are there tinkering with your car. Is it worth having a $20,000 solar energy system with battery backup? Or should you just buy a $500 generator and a bunch of fuel cans? Is the convenience of solar panels worth it? Are you prepared to buy another set of batteries in 10 years, or would you rather just buy another $500 generator when the first one dies? The off-grid world gives us many clues about why batteries may not be ideal for household backup energy needs. Batteries have many positives. They are generally clean, quiet, elegant solutions to energy storage needs. As technology improves, increasing energy density and decreasing costs, batteries will undoubtedly fulfill the energy storage promise we all want. There are also many negatives. They are expensive, you need a lot of them to cover whole home backup needs, and they don’t work without a whole host of other equipment. In the end, it’s hard to make a viable economic argument for batteries in home backup applications, especially in Florida where TOU electricity rates are not prevalent. If you are an early adopter, your backup needs are modest, and you understand the limitations of battery backup, by all means, go out and get a Tesla Powerwall. The technology is amazing and the quality is undoubtedly great. Just go into the experiment with the understanding that there is no magic bullet. This product will not save you money, and it will not save the earth. It’s a luxury product that is a seed to fulfilling those goals with future innovation. I have just one question for you more-informed experts. Is it true that Nikola Tesla invented some device to generate electricity from thin air at sufficient levels to power the average residence? @Crissie, No. Tesla was working on ways to intentionally transmit power wirelessly over free air. That does not mean it is free energy. Nobody would generate electricity and waste it by intentionally putting it our over the air so someone could receive it for free. Some people have wrongly said he was working on a free energy device. The air is full of energy waves, but the amount of energy embodied is very small and you would need a collection device on a ridiculous scale just to power one house. Is this a joke?? You are a solar expert clearly defining the use of a battery as a storage vessel, which is correct and common sense. Then you go on to make the assertion you would need 21 batteries for full time use of an estimated 40 kWH per day. Just one question did someone shut the sun off? “The Storage vessel” will replenish it self with solar at a rate dependent on the available sunlight. Which is better than fighting over gasoline to fill your generator after a hurricane like Irma. No joke. It’s completely accurate. That section is about battery backup only, assuming you do not have solar panels. If you were to continue reading there is a section called “Batteries and Solar Panels” that addresses the two together. Still, with solar, you cannot make the assumption that solar power will always be available. You need to plan for your worst-case scenario, which would include sustained poor weather and overnight loads. The point of that is there is no simple answer like “You need X solar panels and Y batteries.” When you have solar plus batteries you still need a substantial amount of battery capacity to address those scenarios, unless you have generator backup and a sustainable fuel source. Backup and solar power production are related but not easily defined when combined.